Edisto Beach—A quiet little place to enjoy the beach. 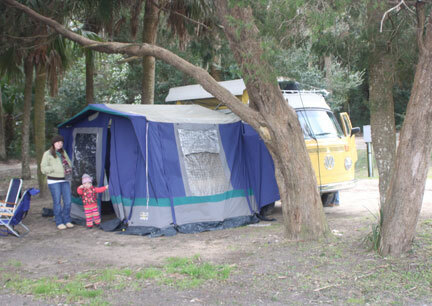 Edisto Beach Campground is a quiet little place 57 or so miles south of Charleston, SC. 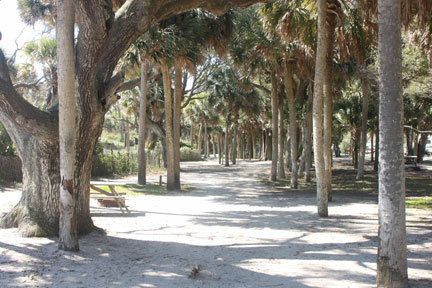 The community of Edisto Beach is comprised of locals, full-timers, part-timers and vacationers and residents. A friendly place with lots of history including plantations, slave trade, cotton trade, fishing, bird hunting, beach lodges, a variety of types of crop farming, moon-shining, pig farmers and oyster harvesters to name a few. 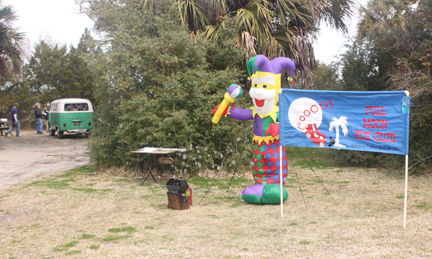 FULL MOON BUS CLUB with a bubble machine to boot! About the time of the full moon, the tides rise and odd things sometimes can happen. 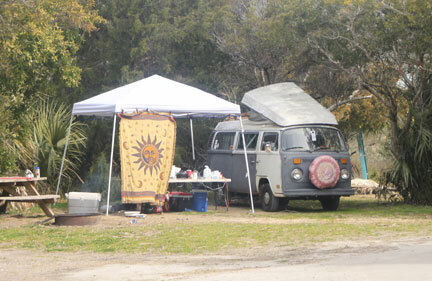 For example out-of-the-blue the FULL MOON BUS CLUB ambles into the campground. Children of the 50s, 60s, 70s, 80s perhaps even 90s arrive in their beloved Volkswagen buses for a weekend outing (with a full moon of course) get-together at the beach. 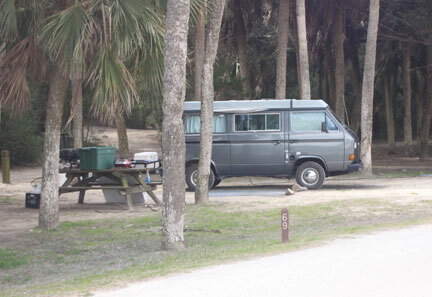 Some arrive as much as a week early in their vintage mini-motor homes. About mid-day—each following day—the familiar purring and farting of these wonderful camping classics begin to trickle into camp. Driven by long bearded men, gray haired women, men with Indiana Jones hats, and women clinging to their children. A raft of pets from Chihuahuas to Dobies and lots of friendly waves and smiles. An odd lot of people you might say. Of widely disparate generation gaps, clothing and appearance styles, everyone from Hippie to Cowboy to Wilderness Protector and everything in between is represented. A quiet, respectable lot that brings warmth, camaraderie, and warm fires to my temporary campground home. I am invited to the celebration cookout, in a big yellow-striped festival tent with so much food you can’t eat your way through to the other end. Laughter, soft music, a guitar here or there and a bubble machine to make Minna jump with joy. Camping folks. There is much interest and conversation about my little vintage trailer from people who live and breathe vintage vehicles. And also great interest in my journey. I pass the word about the fresh water available free at the town hall spigot. Really good sweet water and WIFI available near the camp office when you know the posted password. Hope you enjoy the photos. I have guessed at the year of each VW Camper using the VWbusgallery as a reference. This was really interesting. Sounds like you and Minna had a great time. Takes me back to “the good old days.” Thanks for sharing this with us. Really nice blog. Will continue to follow your adventures. This looks like so much fun! I would so love to meet these people. I am really enjoying traveling with you Bill!